As the most popular computer operating system, Windows has been existing for many years and also has brought a lot of conveniences to you to a large extent. In most cases, you will obtain the smooth and exact using experience due to the powerful support of Windows hardware and software technology. However, with time passed by, the Windows operating system doesn’t run well all the time. You may encounter a variety of errors from now to then. Among the unhappy error situations, one of the most common problems is the Advrcntr5. dll missing error. If it is your first time to hear about the term, you can stop here for further information about Advrcntr5. dll missing error. If you have been confused by this error and you are eager to know the solutions of Advrcntr5. dll missing error, you can also find the related solutions from the below. Part 2: How to fix Advrcntr5.dll missing errors? Part 3: What alternative can be used to prevent the error from happening? Before giving the corresponding solutions for Advrcntr5. dll missing error, you have to the specific meanings of the related words and its main symptoms and possible causes. What are the symptoms and possible causes for Advrcntr5.dll missing error? When will the Advrcntr5.dll missing error appear on your computer? Usually when a program requires the Advrcntr5.dll file which was not found on this system, then Advrcntr5.dll missing error will appear on your screen. So generally speaking, the causes for Advrcntr5.dll missing error mainly lie in that some Advrcntr5.dll files have been deleted, damaged or removed from the folder. Usually you can see the following common errors. What is Advrcntr5.dll and what is DLL file any way? Advrcntr5.dll is known as a part of DLL file refers to AdvrCntr Module developed by Ahead Software Ag for the Windows Operating System. The Advrcntr5.dll is located in the C:\Program Files (x86)\Common Files\Nero\AdvrCntr5\’ folder. What is DLL file? Actually, DLL is short for dynamic link library and the DLL files allow a variety of multimedia software programs to share. So Advrcntr5.dll files are commonly stored in the right places in order to be used by Nero program to burn CD or DVD properly on the operating system. Since the deletion or removal of file Advrcntr5.dll will result in the Advrcntr5.dll errors, what will you need to do to fix the Advrcntr5.dll missing errors? You can take a try on the following steps respectively. Step 1. Restart your computer. Sometimes it may be a trick on your computer, then you can restart your computer to clear Advrcntr5.dll missing errors instantly. Step 2. Reinstall Nero on your computer to restore the file Advrcntr5.dll. Step 3. Install the latest Nero update if there is one available. Step 4. Restart computer again. Step 5. Run a virus scan of your computer if the above steps don’t solve the problem. Part 3. What alternative can be used to prevent the error from happening? Since the advrcntr5.dll missing error may confuse you to a large extent, are there any alternatives to prevent the error from happening? What other programs will not result in the errors? Just as you know from the above, when the Nero program tries to burn DVD, the advrcntr5.dll missing error may happen. So why not try another DVD burning alternative? Now I will strongly recommend Leawo DVD Creator for your future reference. It has many powerful features and functions. ☉ Multiple built-in menu templates and edit disc menu with personal preferences. ☉ Easily editable video effects, 2D to 3D conversion support. As a powerful DVD burning program, it can allow you to burn more than 180+ video formats into a DVD disc with 6X faster speed. The videos in AVI, MKV, MP4, WMV, Xvid, MOV, and FLV can be burnt to DVD-9 and DVD-5 discs. It also has a built-in photo slideshow maker which can allow you to burn photos to the DVD. In order to present customized DVD experience, Leawo DVD Creator can easily provide more than 40+ types of disc menu templates without any advrcntr5.dll missing errors. What’s more attractive is that you can even DIY your own disc menu within the program. Advanced Technology ensures fast burning speed, and high video output quality will provide you better viewing experience. Additionally, there are more powerful features and editing settings. 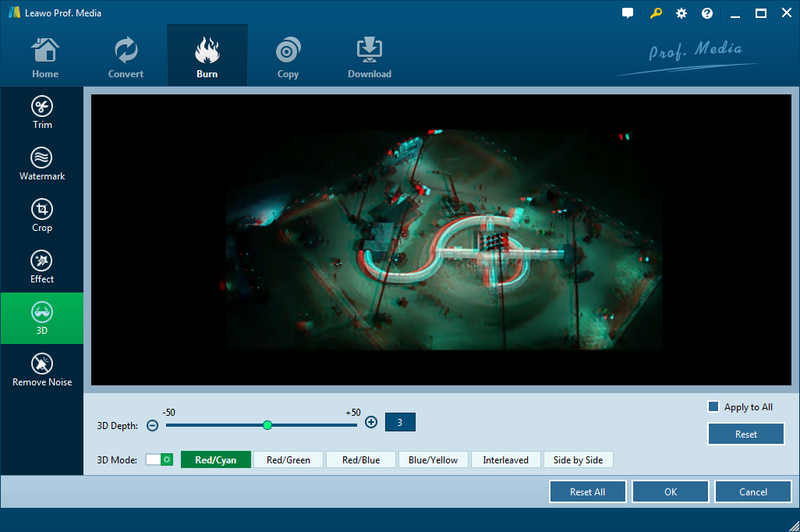 You can freely edit the videos before burning into a DVD disc based on your own requirements, such as cropping video, adding watermark, adding 3D effect and so on. Also, you are allowed to choose subtitles and audio tracks freely. You have to guarantee the safety of Advrcntr5.dll files in order to prevent the Advrcntr5.dll missing errors from happening. You can take a look at the above solution steps and it will help you to solve the problems immediately, or you can take a try on the Leawo DVD Creator as the alternative to prevent the problem from happening again. Also take a look at Best Windows Media Player alternatives if you have problem using Windows Media Player, I’m sure it helps too.